I have joined in on the Annual Inspirations Blog Hop with other fellow Close To My Heart Consultants to showcase the great new products in the new Annual Inspirations Idea Book. While I am not ready for summer to be over, I am in love with the fall papers found in the Pathfinding paper line. The majority of my card was created with the Pathfinding Cardmaking Kit. While the cardmaking kit comes complete with instructions and supplies to create 15 cards, I have ventured out and created my card based on the sketch this week at Mojo Monday! 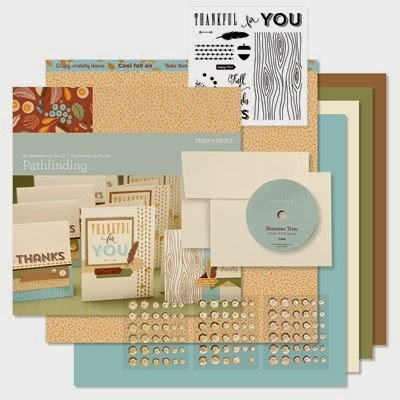 The Pathfinding Cardmaking Kit comes with an exclusive stamp set. Even if you are not into making cards from a kit, the stamp set and contents are well worth purchasing for your own designs. I stamped my own background paper using stamps from the kit. I added a few googly eyes from my stash to give the owl a little character. Be sure and hop along to see other fabulous creations created with new Close To My Heart products! Love your card Allisa, so pretty!! Allisa, your card is so pretty. I love the cute owl and the fab papers. Thank you for joining us for Speedy Fox and Friends challenge. Thanks for joining us this week at HIMCR for the color challenge.